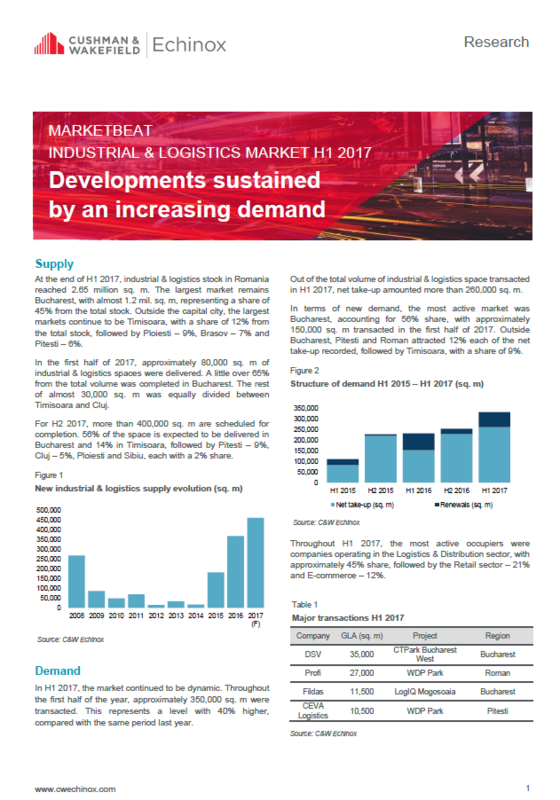 • At the end of H1 2017, industrial & logistics stock in Romania reached 2.65 million sq. m.
• In the first half of 2017, approximately 80,000 sq. m of industrial & logistics spaces were delivered. A little over 65% from the total volume was completed in Bucharest. • Throughout the first half of the year, approximately 350,000 sq. m were transacted. • The Romanian industrial & logistics market is expected to continue to grow going forward. For the second half of 2017, another ~400,000 sq. m is scheduled for completion across the country.